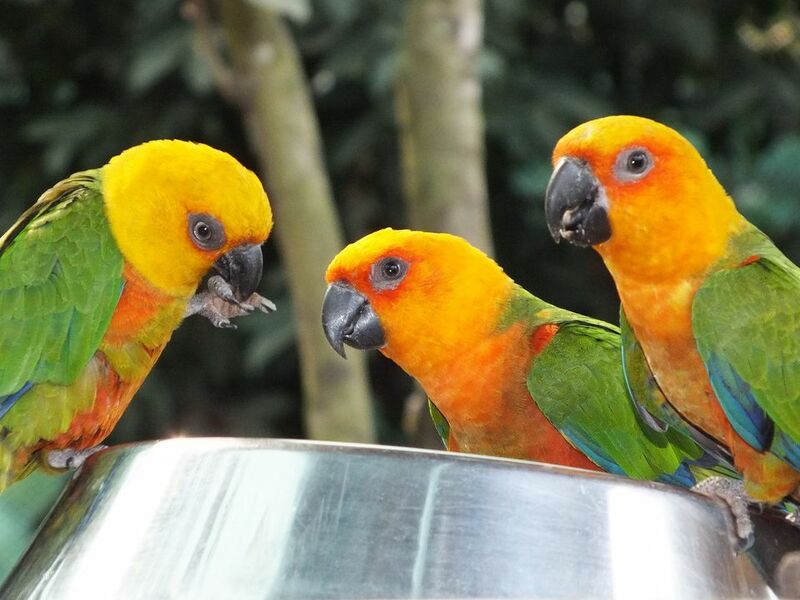 Convivial Conures Chowing on Chia. Chia seeds can be found everywhere now: health food stores, grocery stores, and you’ll even find them as a choice when you order a smoothie. They have been added to the list of superfoods that have taken the world by storm. But the truth of the matter is, chia seeds have been around a long time. The Aztecs harvested these tiny seeds from the Salvia hispanica plant in ancient times and it was one of the principle foods they consumed. They benefited from these seeds due to the high fiber content as well as the omega three fatty acids that assist healthy heart function and reduce inflammation. Primarily grown in Bolivia and Mexico, they were generally imported until one enterprising company saw some potential and began growing chia seeds in the United States in 2014. Originally thought to be a source of food for horses, this changed when research revealed the protein, vitamins, minerals, fiber, antioxidants, and healthy fats they contained. Chia seeds are also high in protein. So high, in fact, that many professional athletes rely on chia seeds to maintain their required levels of protein intake. The best part of this is the fact that the amino acids they contain help to break down the protein to make it more readily absorbed and used immediately instead of simply being stored. Chia seed does indeed contain fat, but that fat is going to help with maintaining brain function. Chia seeds also contain anti-oxidants and a large amount of calcium. This is advantageous when feeding them to pet birds. Birds don’t tolerate dairy products very well and this is a great way of ensuring they are getting the amount of calcium that they require. Dairy is also usually higher in fat than many other products so the substitution of chia seeds for dairy as a calcium source is beneficial to bone health. Chia seeds are considered to be one of the best sources of omega-3 fatty acids on the market. They have a very high concentration of these fatty acids which must be consumed since essential fatty acids cannot be manufactured by the body. Chia seeds contain these omega-3 fatty acids as well as anti-oxidants, a good hit of fiber which is important for digestive health, and a nice array of minerals including magnesium, manganese, calcium, and phosphorous. These important minerals provide a way for bodies to improve bone mineralization as well as red blood cell production. The vitamin factor is pretty impressive, too. Chia contains riboflavin, folic acid, thiamin, and niacin—a B-complex vitamin. In fact, they have twice the amount of niacin as sesame seeds. Also, as they are gluten-free, they are becoming popular with people who are allergic to gluten as well as those looking for that calcium boost due to lactose intolerance. When low on energy, people tend to make food choices rapidly without giving any real consideration to what they are putting in their mouths. Many times the foods we choose are processed foods that tend to be high in preservatives. What chia seeds do in providing energy is give you—as well as your pet bird—an energy boost without using any harmful ingredients in the process. Chia seeds are a healthy raw food with no other added ingredients. They are not processed like many manufactured treats, so you can dredge a piece of fruit through some chia seeds and offer it to your pet bird without worrying about what else is in it. Despite their small size, they pack tons of nutrition for your flock and they don’t even have to be ground up to deliver the benefits like people must do if they want to reap the benefits of flaxseed. Chia seed producers are going head-to-head with the flaxseed producers in several ways: Aside from the fact that the product doesn’t have to be ground as is recommended to get the full benefits of flaxseed, chia seeds can be put in dry storage for up to two years without being refrigerated and they won’t go rancid. Try it yourself! A good way to store chia seeds is to either freeze them or vacuum seal them for dry storage in your pantry when buying in bulk. Chia seeds can be fed to your birds in a myriad of ways. The simplest way is to sprinkle some on their chop. Adding it to a Grain Bake or sprinkling them on as a topping to chop or as a fresh topping on any meal is an easy way to boost nutrition. You can actually make a healthy pudding for your birds using chia seed. When chia seeds are soaked in water for an hour or two, they become somewhat gelatinous with a tapioca pudding-like consistency; chia seeds are capable of soaking many times their weight in water when soaked for a few hours. Soaking some of this seed and adding fresh chopped fruit, some almond milk, and some slivered nuts might entice your bird into eating it. With some pet birds, it’s all about texture and this unusual pudding texture might be appetizing to your flock. You can also add those chia seeds to a smoothie for your bird as well as adding them to healthy frozen fruit pops for birds. Chia seeds are readily available in stores everywhere and you can also order them online. While you can purchase either white or black chia seeds, bear in mind there is little nutritional difference between the two. They are an easy way to boost the nutrition of many dishes for your birds. Take advantage of this tiny but mighty seed and find ways to introduce it into your pet bird's diet.